I'm trying to build my own indicator on NT 8. It should be an automated TrendChannel Indicator. Ufortunatly I can't continiue because I don't find the parameters of the second low of a period. Im at the beginnig of ninjascript and still a newbie at programming. I tried this code for the second low MIN(Low, 75) but it doesn't work on the Draw.Trendchannel method. This work but only for the Currentbar. But I need 1 Anchor First Low of the period and the 2 Anchor the second lowest Low of the period. It should be looking like the white line. Last edited by TradeMyth; 03-20-2019, 02:53 PM. A trend channel will have 2 parallel lines of the same length and 3 anchor points. The first two anchor points are for the first line which set the length and angle of the line. The third anchor point sets where the originating point of the second line will come from, but from there will have the same length and angle of the first line. Are you trying to calculate the price of the anchor of the starting point of the second line? The lowest low between the bars you have highlighted appears to be the first red bar after the first anchor. The second lowest low appears to be the green bar right after it (second bar after the first anchor). Are you wanting some logic that is looking for a specific number of consecutive green bars, then a certain number of consecutive red bars and then on the first green bar after that finding the low? Below is a public link to the Draw.TrendChannel() page in the help guide. Last edited by NinjaTrader_ChelseaB; 03-20-2019, 03:47 PM. The logic for one low should be 2 green Bars. The first picture was false the logic for one low should be 2 green bars. It should look like the new picture. What is the exact logic. You are saying after the first anchor of the drawing object, you are looking for two consecutive green bars and then the first red bar? That would be the 7th bar that appears after the first anchor of the drawing object. The first bar after the first anchor is a red bar. This is followed by 4 green bars. Then there is bar where the open and close are equal. Then there is a red bar. I am not able to understand the logic you are wanting from what you are drawing in the screenshot. Try and write the logic into plain english words. After 2 or more consecutive bars look for any number of red bars and on the first green bar after any consecutive number of red bars, check the low of the previous red bar.. I have adjusted my parameters from before. These parameters fit now. I have added a picture. I added the ZigZag indicator on the chart you can see the movement of 16 ticks drawn in. The channel should look like the red drawn channel in the picture. The movement: One movement is 16 Ticks up or down. Period: The period should be 240 candles. Anchor2Y:The second anchor point should be the penultimate low. Anchor3Y:The third anchor point is the high within the 2 lows (Anchor1Y and Anchor2Y) . How can I code it that way. I would like to try it myself. Of course, if you can help me, it would be great! You will need to be more specific with the logic you are wanting to write. Previously, we were trying to decide on the logic for determining the 3rd anchor for the TrendChannel drawing tool. 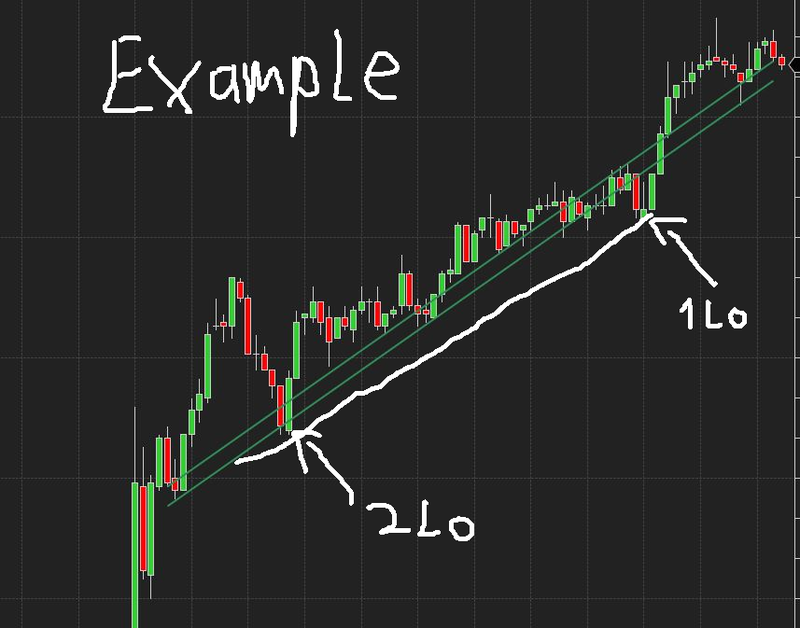 Are you still asking about the TrendChannel drawing tool? To confirm, starting 240 bars ago, after the price rises 16 ticks a trigger would be set, then the price must fall 16 ticks, and on this bar where the price falls 16 ticks you would like to put the 3rd anchor for the TrendChannel, is this correct? No it's not about the TrendChannel drawing tool it's about coding an automated indicator which shows a Trendchannel on the chart. Yes, exactly as you wrote. The 3rd anchor ist just the second line. Thank you for confirming you are still deciding on the logic for determining the 3rd anchor for the TrendChannel drawing tool. You can use a for loop to loop through the last 240 bars. The index will be the barsAgo value. Below is a link to a 3rd party educational site on for loops. In your loop, I would recommend you start the index at 240 and then decrement to 0. Use a bool as the trigger that is set to false outside of the loop. In the first condition, once there is a bar where the high is equal to or greater than the trigger price (the open of 240 bars ago plus 16 ticks), set the bool to true to know the first trigger has been set. In another condition within the loop require the bool to be true and for the low of a bar to be equal to or less than the open of 240 bars ago. When true, save the bars ago value to an int variable as this will be the bars ago number for where you are wanting the action. I'll try it with the loop. I can not even determine the 1 anchor point. I can find out the low of my entered period. But it is not the period i need for my 1anchor. How do I determine the lowest bar or the period of a 16 tick move? how i can define a 16 Tick move into a code ? on the picture the Orange Dot shows the Low of the 450 period. //This namespace holds Indicators in this folder and is required. Do not change it. //Disable this property if your indicator requires custom values that cumulate with each new market data event. //See Help Guide for additional information. Chelsea is out of the office today, but will get back to you as soon as he returns. As we have received an email from you at platformsupport [at] ninjatrader [dot] com, we continue the conversation privately through email.